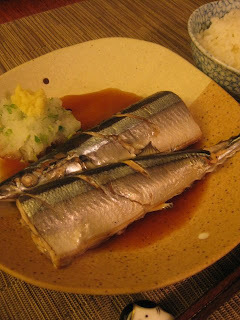 Fall is the peak season for Sanma fish (Pacific saury). 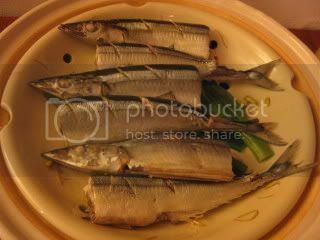 When it's in season, sanma is really oily, juicy and taste so wonderful. In recent years, thanks to the improvement of the frozen technologoy, sanma can be found at stores all-year-round, and the quality is mostly decent. Last weekend, I found frozen sanma (imported from Japan) at a Japanese market in LA, so I picked them up to cook for dinner. The most common way of cooking sanma is grilling, but steaming worked so well with this fish, and the fish tasted even more delicate than grilled sanma. Clean the fish by removing the gut and rinsing throughly. Pat dry both inside out. Cut each fish into half. Place the cut sanma pieces over a few pieces of scallions (green part only) over the steamer. Steam for 4-5 minutes, or until the fish is cooked through. Serve with ponzu sauce, grated daikon, and other condiments of your choice, such as grated ginger, sliced scallion, yuzu kosho, etc.